As of January 1, a number of new license renewal requirements are in place for insurance producers and adjusters in Louisiana. These include the renewal requirements for both individual licensees as well as business entity licensees. In a nutshell, adjusters and producers will now have to renew their licenses in a different year than previously, along with their surety bonds (for adjusters), as well as pay different fees. Read on for a full overview of all changes to the renewal and fee schedules. Start your public adjuster bond application today! Why us? 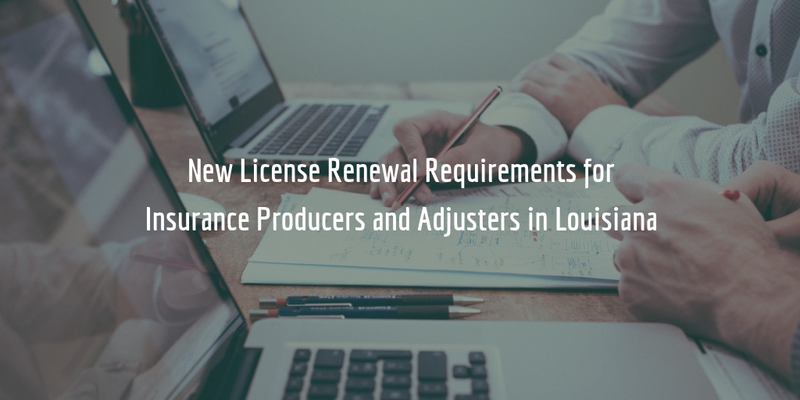 Beginning on January 1, 2018, insurance producers and adjusters in Louisiana will have to follow a different renewal schedule for their licenses issued by the Louisiana Department of Insurance (LDI). The new renewal procedures will be as follows. As of 2018, producers will be required to post only one renewal application to renew all the lines on their license. Until now, producers had to renew in even or odd years, depending on the lines of authority on their license. Now producers will renew their license latest by the last day of their birth month in an odd or even-numbered year based on their license number. Those ending in an even number will renew in an even-numbered year, and those ending in an odd number vice-versa. Since all lines are now renewed together, producers who do not renew a particular line at the time of renewal will have that line canceled at the line’s expiration date. Canceled lines can be reinstated by producers within two years by them complying with continuing education requirements, and filing a new application for this particular line. After these two years, an entirely new application (including pre-licensing education and examination) will be required to add that line to one’s license. If they are late with their renewal application, producers will need to pay $50 penalty fee. Insurance adjusters will now also renew their licenses differently. Previously they had to renew their licenses only in odd years. Now, similarly to producers, their renewal deadline will be on the last day of their birth month in an odd or even-numbered year, depending on the last digit of their license. This means that their $50,000 surety bonds will also need to be renewed at a different time than usual. Unlike producers, adjusters’ renewal fee does not change, and remains $50, along with the $50 late filing penalty fee. Finally, adjuster and producer business entities (i.e. agencies) will need to renew their licenses latest by March 31 on even or odd-numbered years based on the last digit of their license. Producers, adjusters, and agencies can renew their licenses in two ways. They can either renew them through the LDI’s Industry Access Portal or through the website of the National Insurance Producer Registry (NIPR). Finally, at the end of October 2017, active adjuster and producers licenses were updated to match the new renewal dates. For some licensees who renewed in 2017, this may mean that they will have to renew their license again in 2018. These will be excluded from the continuing education requirement when renewing their license during this year. They will also receive a notification of their approaching renewal deadline 120 days in advance. To find out whether you need to renew your license in 2018, you can use the Louisiana Department of Insurance’s license renewal quick check website. Renewing Your License and Bond? Will you be renewing your public adjuster license and bond this year? Submit a bond application form to get a free quote on your bond! We offer access to exclusive rates on all our bonds.